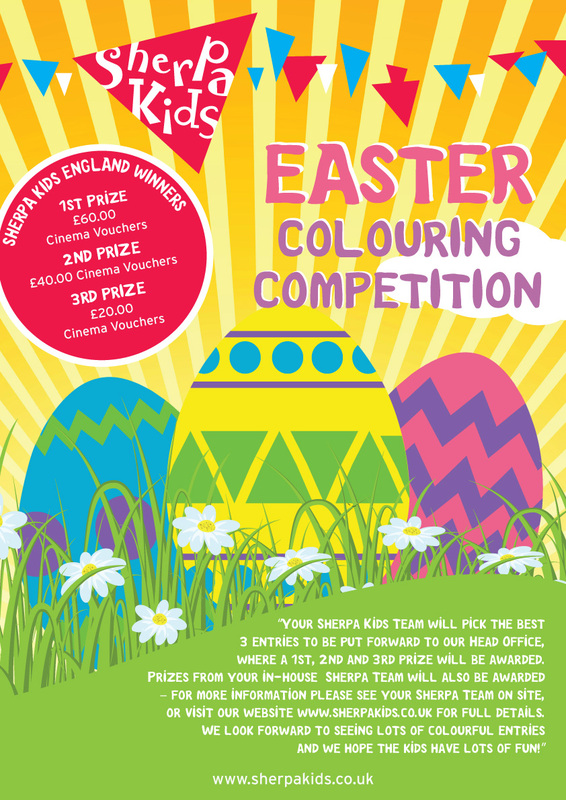 We are delighted that a number of our Sherpa Kids settings are getting involved in this years’ Easter Colouring Competition. If your child’s school is participating (please see the list below) you can get an entry form at the school or click on the PDF icon below to download. Your onsite Sherpa Kids Team will pick their best 3 entries to be put forward to our team at Sherpa Kids England. Our Head Office Team will then select a winner and 2 runners up, who will be awarded the prizes as listed below. Judging will take place week commencing 16th April 2018, so please be sure to return your child’s entry to your in-house Sherpa Team by Friday 23rd March 2018. We look forward to seeing lots of colourful entries and we hope the kids have lots of fun! The completion of the Parental Consent Form gives permission for their child’s entry to be used by Sherpa Kids for the purpose of evaluation/judging to allow the panel of judges to select a competition winner . All competition entries may be used for activities such as social media, relevant publications and online usage. This would apply to any entry, not specifically those that are placed as a winner or runner up. Sherpa Kids is not responsible for any misprint or misrepresentation, nor is an entry to be viewed as a guarantee of a winning entry. All Entries have to be handed in to their local/in-house Sherpa Team by Friday 23rd March 2018. Judging will take place the week commencing 16/04/2018. The Sherpa Kids England three winning entries of the Sherpa Kids Easter Competition will be displayed on this website and on the Sherpa Kids England Facebook Page https://www.facebook.com/sherpakidsuk/ on or after the Wednesday 18th April. The name of the school, class year and gender of the winner(s) may be included. No full names of children will be included/printed. Parents/Guardians of the winners of the National Competition will be contacted by a member of the Sherpa Kids team after the Easter School Break to confirm what brand of Cinema Vouchers they would prefer.